Soon enough, UCF Football will kick off its 2018 season. Last year, the Knights finished 13-0, won the AAC, beat Auburn in the Peach Bowl and claimed a National Championship. Now, a new coaching staff led by Josh Heupel will try to guide a talented roster to another big year. Every Saturday until the season starts, we’ll be breaking down a different opponent on UCF’s schedule. UCF is set to host Cincinnati in its regular season home finale on Nov. 17, looking for a third straight win over the Bearcats. Coach Luke Fickell took over last year and went 4-8, which was the same mark that Tommy Tuberville put up in his final season. It seems like it’s been a long while since Cincinnati won a share of the AAC Championship in 2014. Fickell is trying to get the program back to being a contender, but it might be a process. The quarterback position almost went through a big change over the summer with highly-coveted Ohio State transfer Joe Burrow listing the Bearcats among his top three choices. Instead, he chose LSU. Cincinnati should still be in good hands under center, with senior Hayden Moore returning after a solid 2017. He threw for 2,562 yards and 20 touchdowns last year while adding 312 yards and four scores on the ground. He did throw nine interceptions, which likely played a part in Cincinnati being tied at No. 110 in scoring offense (20.9 points per game). According to Fickell, redshirt freshman Desmond Ridder and true freshman Ben Bryant are challenging Moore for the job. Even still, it’s hard to picture a world where Moore isn’t the starter when his team hits the road to square off with UCLA in week one. Sophomore Gerrid Doaks only started three games in 2017, but finished the year as the team’s leading rusher with 513 yards. He returns, presumably to be the lead back, in 2018. There is some depth behind him as well, with Michael Warren II (324 yards, six yards per carry) and a couple of promising freshmen set to get their share of carries. Leading wide receiver Kahlil Lewis (61 catches, 676 yards, seven touchdowns) is set to carry the receiving corps once again, with help from juniors Thomas Geddis and Jerron Rollins. The offensive line had a lot of moving parts last year, so the unit might still be figuring things out this fall. But by mid-November, the Bearcats should be all set up front. Cincinnati’s defense allowed 31.8 points and 428.5 yards per game last year, ranking No. 94 in both categories. This year’s unit has some potential studs around the field, but they will all have to come together if the Bearcats are going to be better. Senior tackle Cortez Broughton was a second team all-AAC selection in 2016, while senior defensive end Marquise Copeland was an all-AAC honorable mention last year. Freshman end Malik Vann was a four-star prospect that chose Cincinnati over the likes of Alabama, Florida State, Notre Dame, Oklahoma and Wisconsin. There is talent on the defensive line, but Fickell needs the group to live up to its potential. The ‘Cats should feel good about what they have at linebacker. Last year’s leading tackler, Jaylyin Minor, is gone. But Perry Young, Jarell White and Joel Dublanko are coming back, as is Bryan Wright, who is moving to inside linebacker from defensive end. There should be enough depth at the position to make up for the loss of Minor. The front seven appears to be formidable, but the secondary needs some work. Three cornerbacks from the 2017 defense need to be replaced. A couple of transfers should help. TJ Johnson (formerly at Penn State) and Cam Jefferies (formerly at Bowling Green) appear ready to step up for the Bearcats. Tyrell Gilbert, a former safety, is also an option at corner. A pair of sophomores, Darrick Forrest and James Wiggins, are set to take over the safety position. Chris Murphy, another transfer from Arkansas, will also get snaps at safety. Australian punter James Smith was a first team all-conference selection as a freshman last year, landing 21 kicks inside the 20. He was tops in punt yardage (2,688), though Cincinnati punted more than any other team in the conference. At kicker, the Bearcats were a mess in 2017. Last year’s roster featured Andrew Gantz (0-for-1), Josh Pasley (3-for-6) and Ryan Jones (6-for-10). Fickell is hoping to see better results from freshman Cole Smith in 2018. Cincinnati appears to be going in the right direction under Fickell. The Bearcats’ schedule is tough in places and easier in others. Opening in California against UCLA will be difficult, but a string of games against Miami (Ohio), Alabama A&M and Ohio seems manageable. The conference schedule starts with UConn and Tulane before things get tougher. If things come together for the defense and the quarterback situation gets figured out, Fickell might just be able to get the program back to bowl eligibility in year two. Final Thoughts: By the second-to-last week of the season, Cincinnati should have most of its basic questions answered. Even still, UCF isn’t a good matchup for team that is still developing. 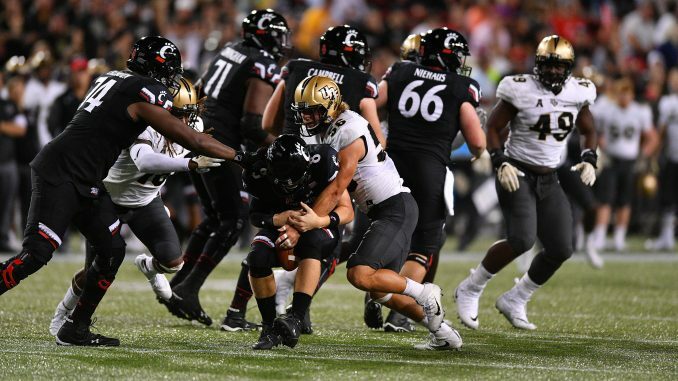 The Knights scored on every single one of their possessions in last year’s game against the Bearcats before the game was cut short after three quarters due to weather. This will be UCF’s final tune-up before what could be a division-deciding game at USF. Expect the Knights to take care of business here.